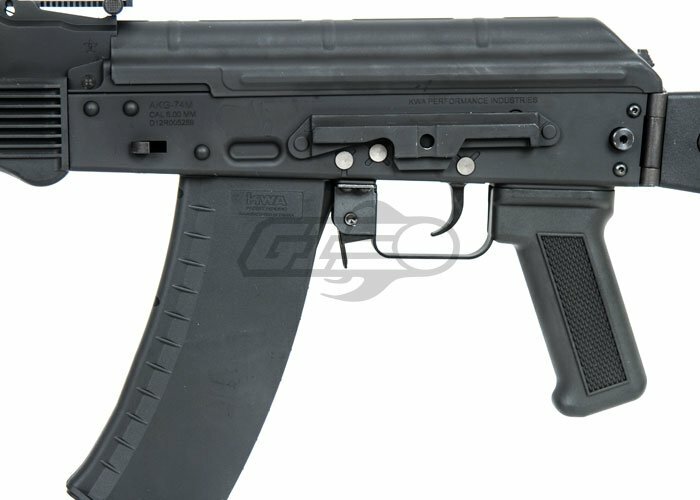 Since 1988, KWA has been a well-known airsoft manufacturer that creates high-quality. From airsoft electric guns to gas blowback airsoft guns, Engineered to Outperform, defines the quality of their products. Externally, the material they use is designed to withhold a serious amount of stress giving the gun the utmost durability. Internally, the parts used in their airsoft guns are matched to the highest degree for the smoothest operation over long periods of operation. Overall, their product truly performs on the field, KWA products stick to their motto, Engineered to Outperform. The AKG-74M Gas Blowback Recoil is KWA's high-end take on this powerful field rifle. The Kalashnikov automatic rifle model 1974, or AK-74M, is currently the most updated version of the proven AK design that was first developed by Mikhail Kalashnikov in 1946. 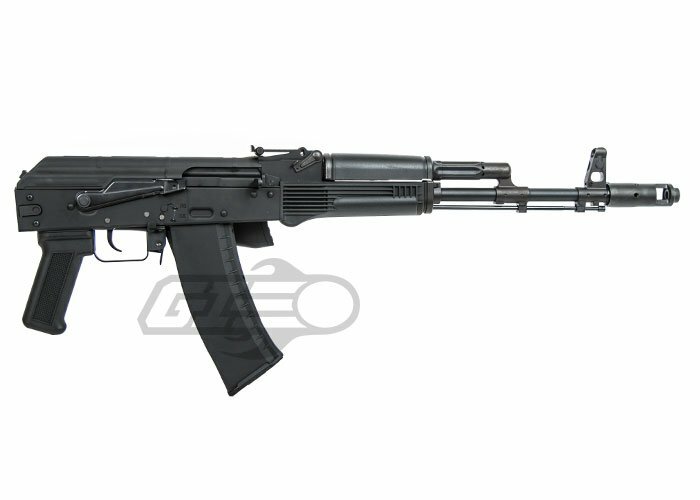 This version of the AK design fires the smaller 5.45x39mm cartridge and utilizes polymer furniture that results in a lighter, more accurate and more reliable rifle than its predecessor. Developed during the early 1970s, it first saw service in 1979 in the Soviet and Afghanistan conflict. It is still used by many of the former countries of the USSR as well as eastern European countries, Mongolia, North Korean Special Forces and the Vietnamese People's Naval Infantry. 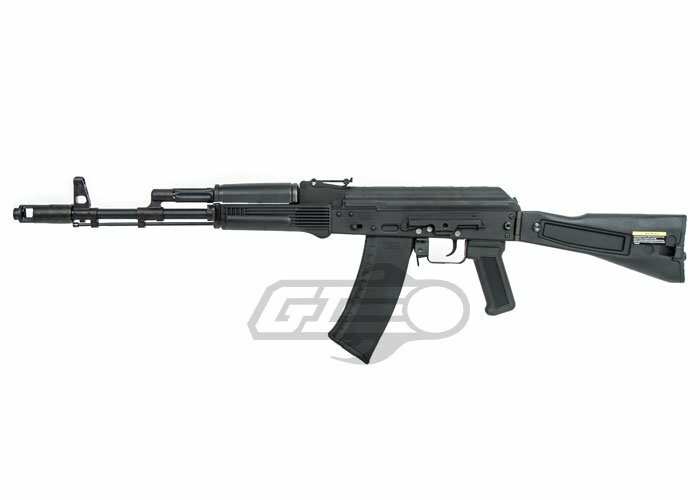 The KWA AKG-74M is an ATF-approved gas blowback AK-style rifle that was designed to accurately simulate the AK platform. It features a full metal alloy receiver and high-impact polymer handguards, pistol grip and full side folding stock just like the actual firearm. 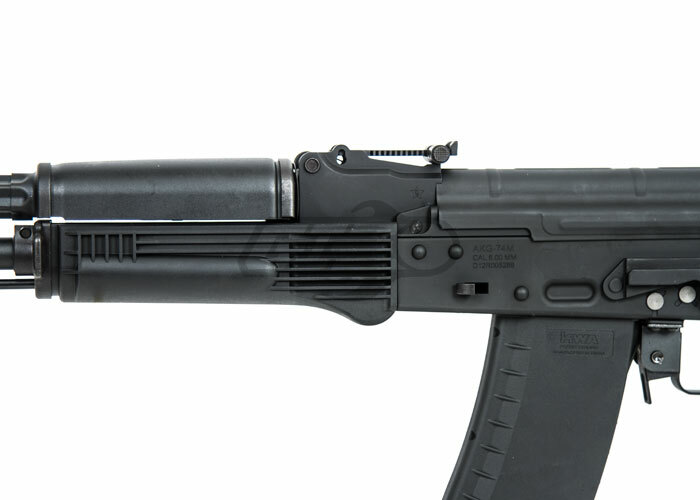 An AK side rail mount on the receiver allows users to expand their platform with AK specific mounts and accessories. An efficient gas system, which can run on green gas or propane (not included), gives the AKG-74M GBB Airsoft Rifle amazing muzzle velocity and a satisfying kick with each shot. KWA has added integrated sling points and adjustable sights that improve your chances of battlefield success. Realistic construction means that the rifle functions and operates identically to its real firearm counterpart. 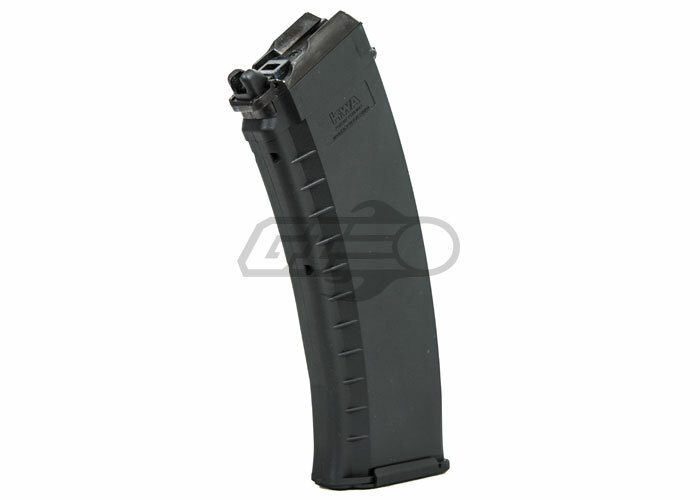 The blank fire demo mode built in the included AKG-74 magazine allow users to train safely without chambering a round. When you are ready for combat, you can fire up to 13 BBs per second in full-auto firing mode, which is very accurate when tuned with the adjustable hop-up. Adjustable front and rear sights are another way to improve your chances of drilling your target. 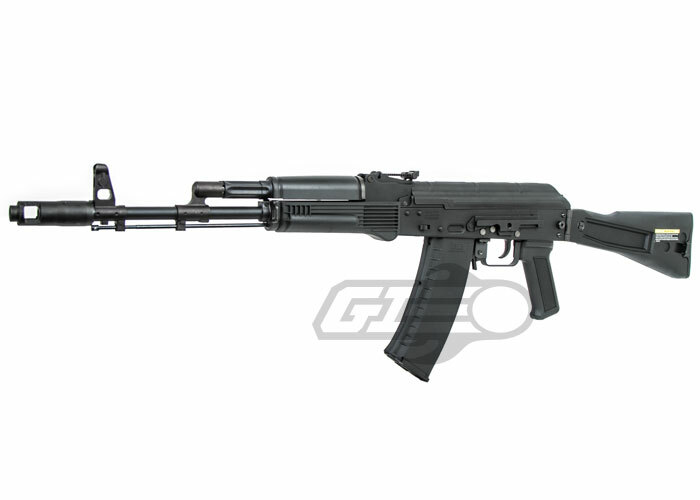 Powered by the KWA Force Velocity engine, the KWA AKG-74M Gas Blowback Recoil is a strong, reliable rifle for those interested in training with the AK platform. Optic and Mount ARE NOT included. The KWA AKG 74M GBBR is an EXCELLENT airsoft replica! I got the gun for my birthday this year, and I couldn't wait to open it and bust a few shots out of the gun. The full metal construction and polymer folding stock, grip and front hand guard are exceptional! The polymer parts do not wobble at all, and the weapon feels very solid! I have seen people already putting rails on the weapon, I personally haven't bought any for it yet, but I plan on doing so very soon. The clang of the bolt when you charge the weapon and while it fires is SO satisfying! Overall this weapon is great for Russain/AK enthusiasts and is a great primary weapon for a Slavic soldier/rebel loadout. 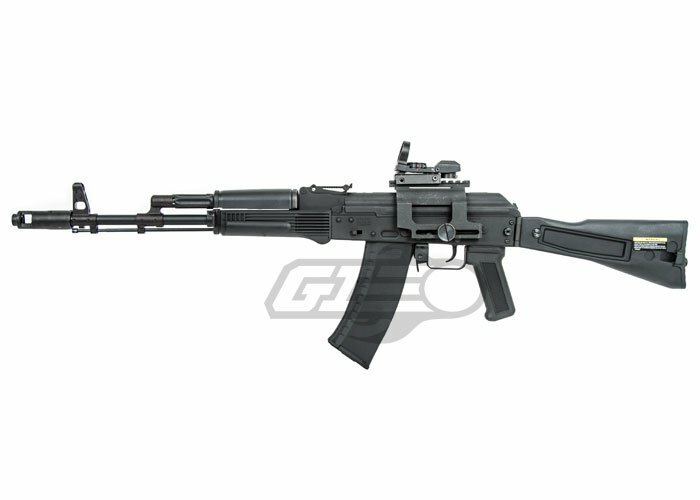 If you have about $400 to spend on a GBBR, I would HIGHLY recommend this weapon. -Easy operation/field stripping (In my opinion, at least). -The magazines have switches that allow it to change from blank/movie mode to skirmish mode. -The stock flash hider is easy to remove (Press down on a spring loaded button on top of the flash hider, and twist it off) It makes it much easier to change the flash hider for a similar one of your choice (Why don't more companies do this?). -The iron sights are decent for an AK, you can change out the rear sight for a better one easily, as well. -The magazines have a MASSIVE reservoir... You can hold just about 2 full charges of 40 bb loads. 1) It opens a small hatch in the back of it that serves a secret compartment (The hatch is rather small, so I prefer not to use it, almost got my finger stuck in it once). 2) It serves as a release for the stock when it it folded to the side (You can pull the stock back either way, pressing the button, or just pulling the whole stock back with your hand, they are both effortless to do). -The built in sling mounts work rather well with my Condor One-point sling. -It is an excellent movie prop. -The bolt charge is very, VERY satisfying (I mess around with it for hours at home, It's just SO nice!). -The Price, but it is definitely worth the work. -The magazines, they only hold 40 bb's, and if you only have 1 magazine, you'll need to have a green gas can on handy during a game, and a couple speedloaders (I now have 3 and I have no issues during 30 minute games, I may have to refill a mag or two with bb's, but I rarely run out of gas in my mags during a game. -The lack of rails, but buying aftermarket rails... or even real-steel if you want, can solve that easily. -The small key used to flip the switch between Blank-fire and Skirmish mode can get lost very easily, if your not careful. This happened to me ONCE in an airsoft game, but I found an Allen-key that fit the holes and I could turn the switch. This gun satisfied me greatly and gave me few disappointments. You should know that I look for the worse in all guns. The weight is very spread out, not front heavy. This is my 2nd KWA gun and my first KWA rifle, this AK still impressed me. KWA's newest creation is quite worthy of having the name Professional Training Rifle as it brings the game to life and honors the actual AK rifle. I need a product that can bring down my FPS as much as possible, I know someone mentioned a DangerWerx flute valve, but I can't find it for this gun. Please link me something that works with this gun. Thanks. Contacting KWA for that part would be your best bet. We don't carry that part. 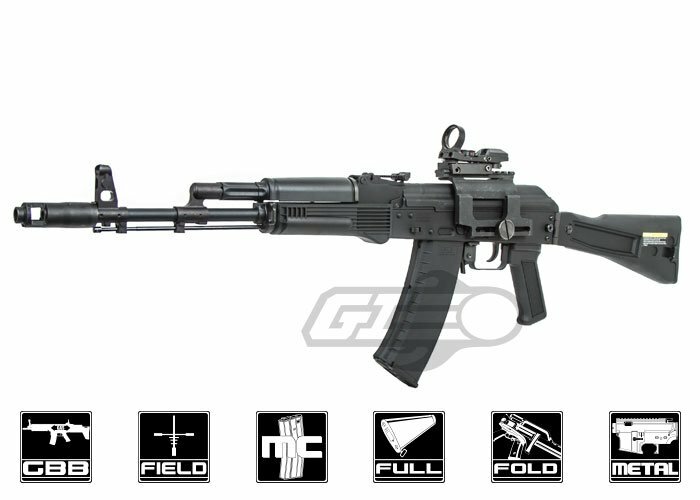 Does electric AK47 magazines and other AK magazines fit in this gun?? Could a person put a wood stock on it? Also, could you put real steel pistol grips on it? You could potentially put a wood stock. Modification may be required for proper fitment. you could put certain real firearm pistol grips. 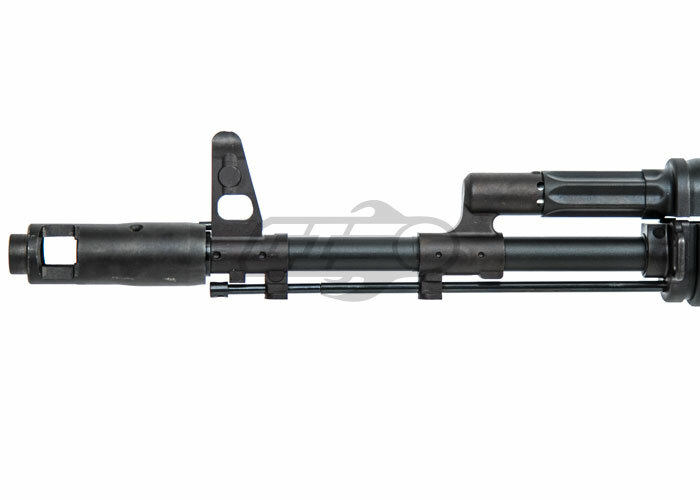 is there a way to make this CQB legal, such as the LM4 flute valve? Danger Werx produces an AKG-specific flute valve to reduce the FPS to a CQB-legal limit. Yes. A .25g BB would increase accuracy over the use of a .20g BB. Simple physics. Is it Possible to put and m4 stock on this rifle? 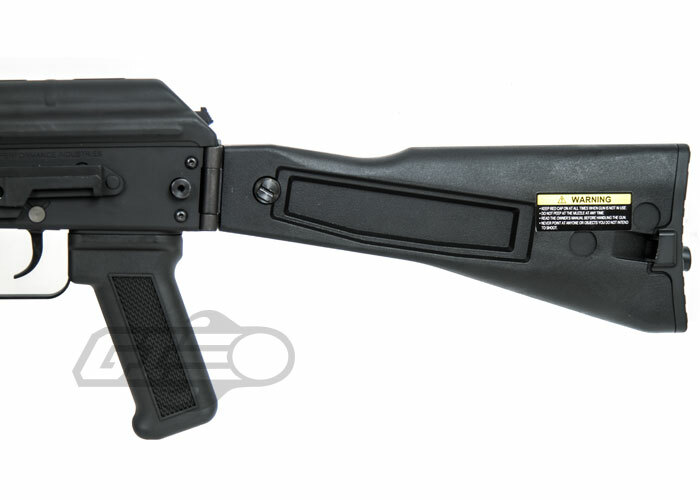 would i be able to change the stock that comes with this gun for a m4 retractable stock? This gun currently will not accommodate a M4-style stock.